The advances in rheumatology have been unprecedented and, arguably, the treatment of inflammatory arthritis has progressed faster and further than that of any other serious chronic disease in all of medicine. Indeed, a patient with rheumatoid arthritis (RA) today can lead an essentially normal life, whereas, a few decades ago, such a patient would have a restricted existence and be easily recognised by the appearance of grave illness, wasting and deformity. Each article represents a remarkable effort by panels of rheumatologists, health professionals and patient representatives to encompass an ever-expanding literature and provide overarching principles as well as specific recommendations. The work of the panels followed guidelines established by EULAR5 and involved systematic literature reviews (SLRs) which are published separately.6–12 The methodology is state of the art and meticulous, reflecting expertise of skilled methodologists and exceptional work of fellows and medical librarians to construct the SLRs. As described in the articles, deliberations of panel members were fair and democratic, with balloting on recommendations conducted until there was agreement. The discussions in these articles are detailed and thoughtful as the authors explain their reasoning and choice of words. ‘Wordsmithing’ is sometimes denigrated as a seemingly pedantic exercise. Wordsmithing, however, is a serious undertaking to clarify thinking and enhance communication. Thus, in the RA recommendations, the wording on the approach to therapy when the first attempt does not reach the treatment target has been revised from ‘change to another csDMARD strategy should be considered’ to ‘other csDMARDs should be considered.' This difference is important and many examples of such word choices illustrate the care devoted to their selection. Among these is the use of the word recommendation rather than guideline. Of the recommendations, those on the management of early arthritis and RA address a central element of rheumatology. Given the size of the published literature, the data underpinning the recommendations are extensive and provide a solid evidence base. In many respects, the recommendations are consistent with the current practice in which T2T approaches are widely followed.13 These recommendations contain few surprises or controversial elements. Perhaps the major changes relate to the position of triple therapy in the hierarchy of therapy and the role of glucocorticoids. As is the case of many treatment strategies for RA, the role of glucocorticoids remains uncertain despite almost 70 years of their use. Unquestionably, glucocorticoids are potent anti-inflammatory agents. For a person with active disease, symptom relief is essential and glucocorticoids can achieve that goal for many patients. Such symptom relief can improve quality of life almost immediately, give hope and solidify a relationship with a rheumatologist. Furthermore, a period of glucocorticoids can provide an umbrella until the onset of action of a DMARD. The more recent conceptualisation of axSpA disease takes a different direction and posits that axSpA can be either radiographic or non-radiographic.27 28 Those with findings of SI can be termed ankylosing spondylitis; those without such findings are termed non-radiographic axSpA or nr-axSpA. Patients with nr-axSpA may have MRI findings but such imaging is expensive and often not available; levels of inflammatory markers such as CRP are often not elevated. As a result, the diagnosis of nr-axSpA can be uncertain unless there is a ‘classic’ inflammatory back pain and other findings (eg, psoriasis, uveitis) that support the diagnosis by an experienced rheumatologist. An important issue in managing patients with axSpA concerns their care before diagnosis. Patients with inflammatory back pain can see orthopaedists, physiatrists, chiropractors and physical therapists among others and years may pass before the diagnosis of axSpA is made or even considered. As shown in studies on screening strategies to identify patients with axSpA, many patients with chronic low back pain may have unrecognised axSpA.29–32 Thus, the recommendations for management of axSpA are relevant only for patients who have a diagnosis but it is very likely that many patients with axSpA never get a diagnosis. Treatment of RA and axSpA also differs in the impact of biological therapy on radiographic outcome. While the effects of DMARDs on erosions are clear, studies have not definitely shown that agents such as tumour necrosis factor (TNF) blockers can change the development of syndesmophytes likely because the process is slow. Interestingly, non-steroidal anti-inflammatory drugs may affect radiographic progression.33–38 In the absence of radiographic evidence of disease modification, the evaluation of efficacy of therapy is based substantially on patient-reported outcomes of pain, stiffness and function. This situation may have contributed to the decision of the Food and Drug Administration to withhold approval for the use of TNF blockers for nr-axSpA. The authors of these three sets of recommendations have performed a valuable service for the field, facilitating best practice, providing guidance that is actionable and highlighting areas for future research. Thus, as inferred in the recommendations on axSpA, the rheumatologist should be facile in using measures such as Ankylosing Spondylitis Disease Activity Score and Bath Ankylosing Spondylitis Activity Index and the nuances of treating a disease where patient-reported outcomes predominate.43 Training, especially at the fellowship level, may be necessary to gain those skills. Furthermore, rheumatologists must develop an interdisciplinary approach to collaborate with other providers to identify among the large population of patients with low back pain, the minority of patients who have an axSpA. The logistical challenges for such an undertaking are large but, to improve the care of patients with axSpA, correct diagnosis is essential. Figure 1 illustrates the flow of patients to the rheumatologist and the importance of screening strategies. 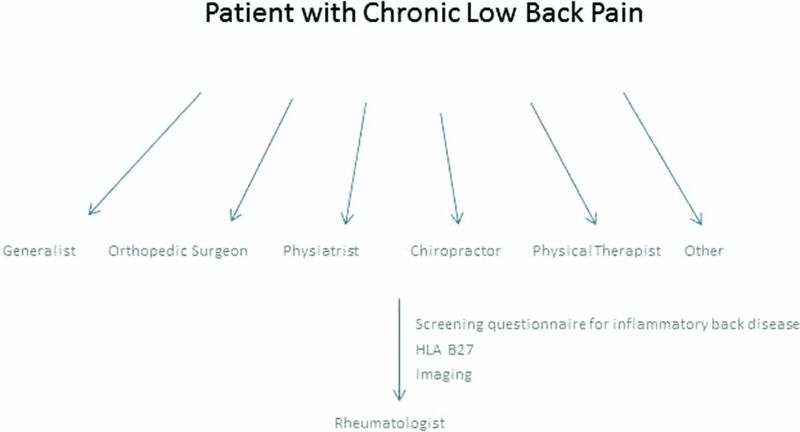 The flow of patients with chronic low back pain to the rheumatologist. Currently, patients with chronic low back pain can seek care from a wide variety of specialists as well as generalists. While the rheumatologist could perform the initial evaluation, in most healthcare settings, that circumstance would be unusual. Because of the large number of patients with chronic low back pain, a screening strategy is needed to assure referral for those with a likelihood for axial spondyloarthritis (axSpA). It is therefore essential that primary providers be aware of the concept of axSpA and screen patients with inflammatory back pain appropriately so that rheumatologists can handle a burgeoning flow of patients for evaluation. Each article concludes with a research agenda, addressing such issues as induction strategies, remission and drug tapering. Such agendas are only likely to increase as new products achieve regulatory approval. Despite their importance, many of the proposed research questions will never be fully answered as the field constantly shifts and expands. The list of research questions, however, is a sign of vitality and dynamism in rheumatology and it was not so long ago that a central issue in the field concerned whether impacting the course of serious inflammatory arthritis was at all possible. Clearly, much is now possible and the research agendas exemplify the achievements of today as well as the hopes for tomorrow.
. 2016 update of the EULAR recommendations for the management of early arthritis. Ann Rheum Dis 2016;75:44–5.
. EULAR recommendations for the management of rheumatoid arthritis with synthetic and biological disease-modifying antirheumatic drugs. Ann Rheum Dis. . 2017. doi: 10.1136/annrheumdis-2016-210715. [Epub ahead of print 6 Mar 2017].
. Safety of synthetic and biological DMARDs-a systematic literature review informing the 2016 update of the EULAR recommendations for management of rheumatoid arthritis. Ann Rheum Dis 2017. doi: 10.1136/annrheumdis-2016-210708. [Epub ahead of print 15 Mar 2017].